Getting ready for college is emotionally tumultuous. Kids don’t want to admit their anxieties and are busy spending that last summer with their childhood friends, parents are stressed about money and making sure that everything is ready. In Order To Succeed is here to help you get your student ready for college life. We reached out to parents and experts to learn about the challenges facing students as they move to college. Here is our advice for conquering this transition. We’ll give you a hint: it all comes down to college student organization! We reached out to parents around the country to find out what their biggest challenges were when moving their students into standard dorm rooms. No matter the region or college, many shared problems in common. Shannon M., successful attorney and single mom of three, lives in Southern Michigan. She has moved her kids into rooms at Northern Michigan University, Western Michigan University, and Purdue University and says the challenge is always the same, “Floor and closet space is extremely limited.” Needless to say, by the time she got to Purdue, Shannon had become a pro. 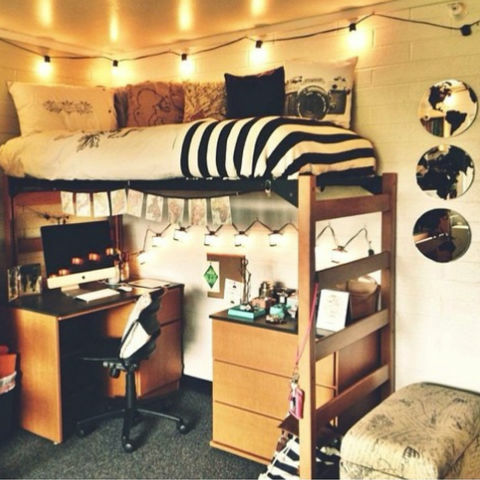 Most standard college dorm rooms are tiny by the average person’s standard. And they generally have a set of bunk beds, two desks, and two bureaus. Shannon says, “Lofting the bed is essential.” She also recommends a loft shelf and hanging pockets for space saving. Lofting a bed is one of the best solutions for small college rooms and helps beat college student organization challenges. This opens up the room by quite a bit because once the bed is lofted, a small desk and fridge or drawers, or large desk can fit under it leaving room for shelving, a love seat, or other essentials. The remaining bed can be lifted using cinder blocks or another technique. Place storage bins or drawers underneath this bed to maximize the small room’s space. Couches also fit beautifully under a lofted bed. No matter the student’s taste there are lots of ways to loft a bed and gain extra space. Ian R., the former Creative Director for NBC Universal, was surprised to find that his Alma Mater, Bennington College, challenged him as a parent the same way the progressive school challenged his parents when they moved him in. “My parents were shocked at the outlet spacing and had to run out and buy a bunch of extension cords. Same thing when I moved my daughter in recently!” While the housing at Bennington includes three newer dorms, most students are in older clapboard houses that have the awful spacing found at colleges around the country. With today’s student relying almost exclusively on technology this is a huge challenge when it comes to getting your student moved in. Ask any travel writer their number one rule when traveling and they will likely give you the answer, “ABC.” What’s ABC? “Always Be Charging.” When there are limited outlets it’s important to make sure that you are charging devices to avoid being left with no battery. Of course, like Ian points out, extension cords can help however they look terrible. Luckily, there are a few quick fixes to help. Create a charging station. 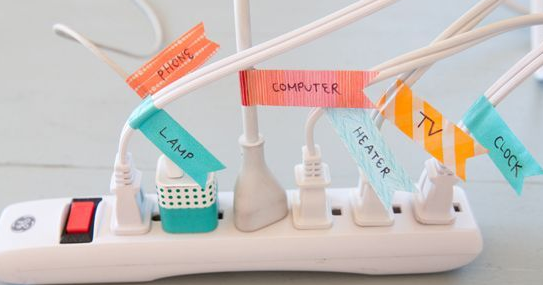 Use a power strip and some washi tape to create a simple charging station. Plug chargers into the strip, use the washi to tape the cords to the back top of a desk or bureau and then plug in as necessary. This is a cute way to add a pop of color while keeping cumbersome cords hidden. Remember that devices should be charged when they are between 40-70% and that devices should rarely run all the way down (except for laptops). If a device does run completely out of juice give it a full charge as quickly as possible. Organize cords. For electronics like stereos, tvs, game consoles and everything else use a little washi on the portion of the cord closest to the plug and label the device to keep things organized. Any slack in the cords should be taken in by folding and tying off with twist ties to avoid the big mess that often occurs. Labeling makes sure that if students need to unplug one thing for another (say a tv for a hairdryer) they don’t plug something that requires being reset or that could be disastrous, like a fridge! John C., a Princeton, NJ based CEO shared that he struggled with having too much stuff when getting to school. Why? Because he wasn’t aware of the measurements of the room. Honestly, even knowing the measurements is problematic because many of us cannot conceptualize dimensions. Like Ben Franklin said, “Measure twice, cut once.” Don’t buy much before checking out the room and getting a good sense of what is actually available as far as space, how furniture can be organized, and getting a feel for the dimensions. Measure everything from where you think you’ll place items to remaining space for tables, shelves, organization units and then make a mock up of your floor plan BEFORE you head out to the store. Do shopping near the college so that you can easily make returns.